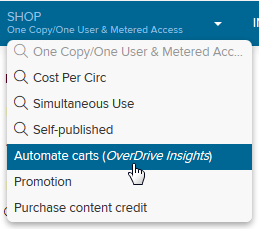 OverDrive offers three cart automation tools that allow you to streamline the processes of selecting and ordering content in Marketplace: Holds Manager, RTL (Recommend to Library) Manager, and Smart Lists. These tools save time and take the guesswork out of collection development by automatically building carts or submitting purchase orders according to your specifications. Additionally, Holds Manager and RTL (Recommend to Library) Manager allow your users or students to help drive your purchasing decisions through their holds or recommendations. For personalized help setting up any of these cart automation tools, please contact your Account Manager (whose contact information is listed under the Marketplace Support tab).